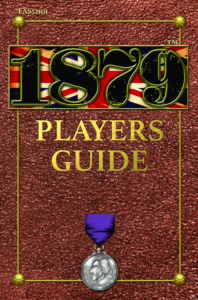 1879 RPG Players Guide – FASA Games, Inc. This isn’t your great-great-grandfather’s London! Victoria and Albert rule over a steam-powered British Empire that spans two worlds. Thanks to the portal known as the Rabbit Hole, a train ride away from London lies the Grosvenor Land, a new world of fertile plains, towering mountains, giant insects, and Babylonians with weird science zombies. Seems they got there first, three thousand years ago, and they’re not exactly the welcoming sort. The Saurid tribes, lizard-like folk who ride theropods and pteranodons, complicate matters further. Back home on Earth, clockwork engineering has brought mechanical computing to the world, and micro-steam engines drive airships through the sky. Stranger things are afoot, too, as a bit of magic seems to have come into the world with the opening of the portal. People are changing. Secret societies are finding their ancient occult practices a bit more effective. Who knows what might be lurking in the forests these days, or in that shipment from China? From the heights of society to the depths of the criminal underworld, from the high street of London to the mountains of the Gruv, adventure is calling. There are worlds to explore, fortunes to be won, and battles to be fought. Onward! Click the book cover or here for the shop!